Corn Soup recipe by Nida Memon at PakiRecipes.com. Wash the chicken and put to boil adding one peeled onion or potato (whole) to prevent the chicken from discoloring. Add enough water because you will need it for the stock. When the chicken is tender take it out and shred it into small pieces. Braise the shredded chicken in margarine for 3-4 minutes and add to stock. 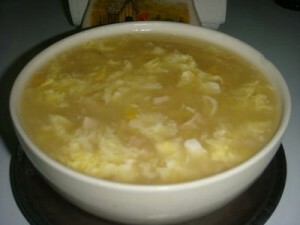 (remove the whole onion or potato from stock and strain it before adding the shredded chicken ). Add the cream style corn , salt , pepper and Chinese salt . Let it cook for a while. Now add the corn flour stirring constantly to prevent lumps. Now add the eggs pouring them into the soup in a thin hairlike stream and stirring the soup on top only with a fork so that the egg forms into streaks. Serve hot with the Chinese chilies.